What are recipe cards, recipes on scraps of paper in a kitchen drawer or old cookbooks with notes in the margin? These are more than just recipes. These heritage recipes - our links with our past and our connections to special people and special events are tied to those scraps of paper. 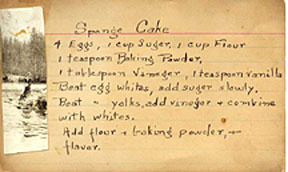 At Heritage Recipes we are dedicated to the preservation of memories and old recipes. As we move through our fast paced, fast food world, we are at risk of losing touch with the special moments when we shared a special recipe -- a special meal -- with a special person. One of my earliest memories is arriving at my Great Aunt Florence’s very early on a winter morning and being greeted with a hug from her and the smell of her fried apples. You’ll find a recipe for Aunt Florence's fried apples, plus many more recipes when you click on the Recipe & Memories link at the left. These recipes have been submitted by visitors to this website. You can join us in the preservation of these heritage recipes and memories by submitting recipes that have been passed on to you by someone special in your life. Along with the heritage recipe, please include your memory of the person who gave you the recipe or your story about the recipe. You can view our heritage recipe index on our Recipes & Memories page, from the Heritage Recipe Index on the left or on the Recipe Site Map. Bookmark our What's New page to check out recently added recipes and stories. For your convenience, we have created an Adobe PDF file for nearly all our heritage recipes. You will need to download Adobe Reader to your computer to print these PDF files. We have been receiving many requests for us to search for lost recipes. We are happy to help but can't always promise that we will find the recipe. 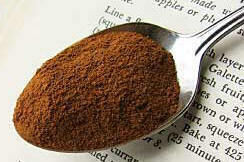 To help with the search we have created blog -- Old Recipe Detective. Sometimes it takes several months for us to find the recipe. Please check it to see what recipes we are looking for...maybe you can help! Before you send us a request for a lost recipe, try searching for it on Google. That's our first search spot and more than 90% of the time we can answer the lost recipe request with a Google search.